Curitiba, 브라질의 모터 홈 꾸리찌바 호스텔 | 호스텔월드에서 예약하세요. Deposit of 50% is required. This amount is 100% refundable in case if cancellation is made 10 days before arrival, otherwise this sum will not be refunded. 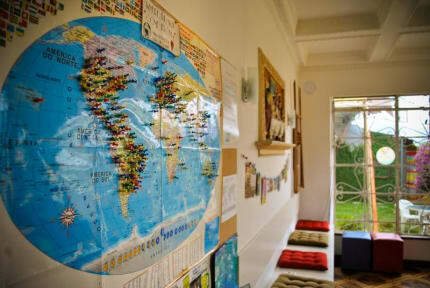 We are happy that you have chosen our Hostel as your home here in Curitiba. We are looking foward to having you here with us and we can garanteee that your staying at our Sunny House will be incredible. The house is very comfortable: the decor has a vintage look, in combination with the architecture of the 1950s. And graffiti, panels and paintings by local artists are already being used to get you acustomized with tipycal climate of the city. It is very easy to make friendships by either chatting in the kitchen, inviting to play the pool, watching a TV show in our cosy living room, sunbathing in the garden or just meeting your roommates in the hall. The Motter Home Hostel STAFF is always sharp with the best tips of the week and they love to help you to ask questions and indicate how to get to the sights of the city. Our accommodations are super comfortable with king size beds, single or double. Cleaning is one of our strengths. If you want a tip for the night, we handle the best parties in the city! For those who like adventures, we offer packages to climb the nearby mountains, among other facilities that you can only find at the Motter Home! There is also mini market with delicacies, drinks and toiletries, as well as the most beautiful and original souvenirs of the city. Nearby you will find restaurants, markets, pharmacies, banks and bars. In 10 minutes walking from our Hostel there are several bus lines that take you to the most varied places of Curitiba. Super easy! The Historical Center and Avenida Vicente Machad are the most popular areas to eat out. They are only a 15-minute walk away. Come to our Hostel because it is also yours! 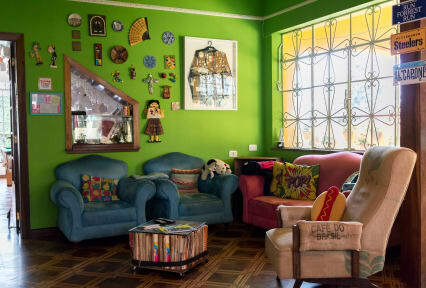 Motter Home Curitiba Hostel is the ideal place for you to stay here, in Curitiba. A beautiful and spacious house full of details from 50s with a perfect environment for those who are looking for a cozy place: serene, clean, and comfortable above all... It is a perfect choice for those who want to feel at home while travelling and enjoying the city! We are 400 meters away from the Square 29 de Março and the bus stop Praça das Mercês. Motter Home is also close to famous attractions of historical center of Curitiba. The Panoramic Tower and the Ukrainian Square are in a 15-minute walk from here. Oh! And if you are not ery up to go out today there is a mini market open 24 hours at the reception! There are two types of rooms in the hostel: private ones with queen size beds and shared rooms with bunks for 9,8 and 4 people. Daily rate includes bed linen, a simple but full of options breakfast: brazilia delicious coffee, milk or juice or chocolate milk, iogurt with granola, fresh fruit, harm and cheese, white breade, whole grain bread, homemade cake, butter and jam and cookies. If you need to cook something for yourself we have a nice common area with well- equipped kitchen. What else do you want? Our staff is 24 hours ready to help you with anything! Do you want some info about city tours? We have it! Do you want to get to somwhere? We are happy to show you the way! Do you want to go out or eat out? We have the best tips ready for you! What else does the best hostel have? A living room with pool table, board games of course! And a computer for shared use, cable TV and high speed WiFi internet access. Moreover outdoor area with a beautiful yard and a garden. Um hostel bem descolado, limpo e com funcionarios muito amaveis!